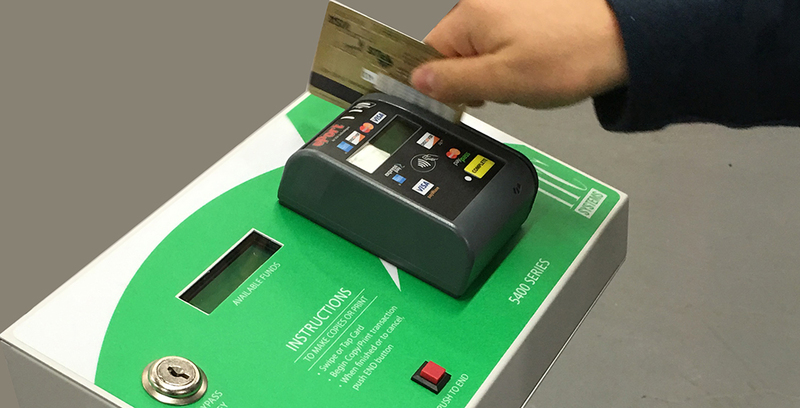 Toronto, December 20th 2015–ITC Systems has introduced the PayStation Swift to its product line up. The ‘Swift’, like its big brother the PayStation Grand is used to control and charge for copies and prints from MFD’s. This sleek and versatile unit accepts credit and debit cards* to pay for copy and print transactions. Also able to interface with our stored value reader, that accepts virtually any legacy stored value magnetic card out there on sites across North America. Perfect for use in Public Libraries, Retail Stores, Schools, Copy/Print Centers and any place a charge for the use of a copier or printer is required. Some of the features include; worldwide credit and debit card acceptance, escrows the value, has a bypass key for staff use, usage meters for reporting, online reporting via the web, multiple price lines available, compatible with GoPrint, PaperCut, Equitrac, Pharos, Envisionware and Comprise Print Software, plus more. Give it a test drive today, for more information on the PayStation Swift; please contact sales@itcsystems.com (416) 289-2344 (314) 872-7772. *Debit in countries that do not allow for pre- authorization of a transaction is not available at this time.